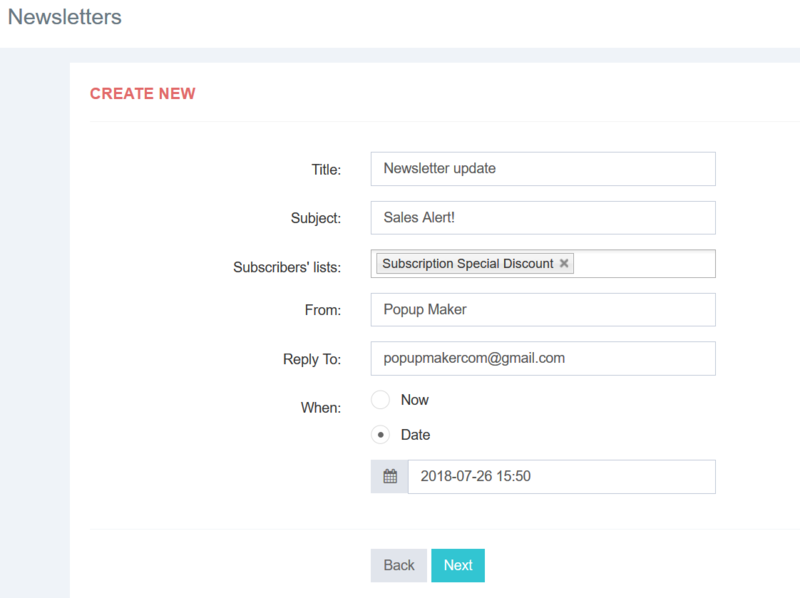 Popup Maker has its own Newsletter tool now which will allow you to send newsletter emails to your subscribers, collected via our Subscription popups. 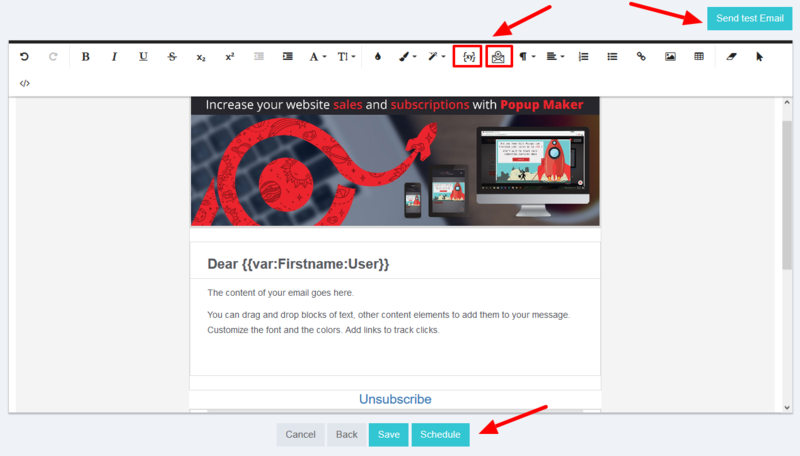 In the Newsletter section of your Popup Maker account, you can Create newsletter forms to send to your subscribers. You are free to Edit, Clone or Delete already created forms. 500 free emails are provided, by default and the count of the sent newsletter emails can be seen on the upper right corner of the screen. Enter the Title and the Subject for your Newsletter, that will be shown in the email. Select your Subscribers&apos; lists, according to your Subscription popups (you can select more than one list). Mention your company name in the "From" field of the form, so that the subscriber will see who is the message from. Enter the email address to which you&apos;d like to receive the answers from the subscribers. Select the time when you want to send the newsletter - you can send it immediately, clicking "Now". Or you can schedule newsletter sending, specifying a Date to send the newsletter later. After filling in the details for your Newsletter, you can proceed to the message itself. Create the message via the provided Templates or Create it from scratch. Add an image for your message, this will make your email more engaging. Then add an addressing greeting text to start the email with, like "Dear User". Use the "variable" option to address your subscribers specifically, by their names, if they have filled it in the form. Like if you set the variable option for the word "User" in your message, and select "**Firstname**" variable for it, it will take the name of the subscriber when sending the email. For example, if the user&apos;s name is Mary, the message will be "Dear Mary" in that case. You can also add an Unsubscribe option under your message, so if the subscrbers don&apos;t want to receive newsletter emails from you, they can easily unsubscribe. When all the form is ready, you can "Send test email" to make the newsletter works as expected.